Ibura Airfield seen above. The second largest US airbase in Brazil, with its three runways and hundreds of barracks. Photo 1943. NAF Recife, Brazil—The airfield at Recife was established by the U.S. Army through agreements with the Brazilian government in 1943. The U.S. Navy established an NAF on the Army base on 1 October 1943. The NAF serviced land-based patrol planes, primarily PV-1 Venturas from VBs 129, 134 and 143. NAF Recife was the home base for FAW-16’s HEDRON from August 1943 through the end of the war. The NAF portion of the field was disestablished on 17 July 1945. Dictionary of American Naval fighting Squadrons. Numerous naval facilities were established at Recife and used to maximum capacity. In May 1942, when naval construction was begun at Ibura Field, Army housing and runway development were well underway. The original plan for basing six patrol bombers was amended to provide for the operation of two patrol-bomber squadrons and one carrier group, together with facilities for refueling and the temporary mooring of one blimp. 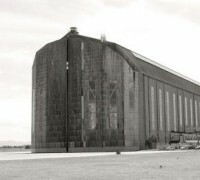 In addition to housing and storage facilities, one blimp mooring, six hardstands, parking, fueling, and repair areas, and shops were constructed for the Navy. 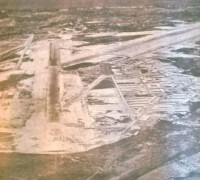 The original construction and that of LTA facilities were under the Airport Development Program; construction of additional housing was under a CPFF contract. Maintenance forces erected additional shops. Knox Hospital, with a 150-bed capacity, was built during the summer of 1942. Under the original plan, 13 Quonset huts were erected by the Airport Development Program forces; a ward, with two 188-by-23-foot wings, was later constructed under a lump-sum contract. In the summer of 1943, a newly built Brazilian government hospital was modified to provide a naval receiving station. Construction of the fuel-oil storage depot in the dock area at Recife was started on November 4, 1942. Ten 10,000-barrel fuel-oil tanks were erected, with connections to the docks and to Ibura Field; existing storage tanks and pipe lines on the piers were also used. Construction required ten months. 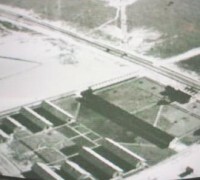 An ammunition-storage base was also built at Recife, partly under the Airport Development Program, partly by Public Works Department maintenance forces, and partly under CPFF contract. The installation consisted of 13 steel arch magazines, three concrete magazines. Two fuse and detonator buildings and a barrack. The project was completed in December 1943, one year after construction was initiated. In December 1942, construction was started to provide for the operation of a destroyer repair unit and to furnish housing for enlisted personnel attached to the staff of the commander of the Fourth Fleet. The necessary shops, warehouses, and personnel structures were completed in two years under the Airport Development Program. All naval facilities at Recife had been decommissioned by November 1945, and the ship repair facilities were transferred to the Brazilian government under Lend-Lease arrangements. In the archival footage above rare images of Mrs. Eleanor Roosevelt in her visit to Ibura Field at Recife. She visited all the compound and had an outdoor lunch with all staff of that base.